Variant is a group of settings which used for execution of operations in system or for assignments to company code. SAP provided standard variants, as per the requirement client specific variants can be created. T010O (Posting Period Variants), T001B (Permitted Posting Periods), T001 (Company codes). Field status variant is used to group several fields into one field status group. In the field status group a field can be defined as Suppress/Required/Optional. Field status group maintain in the G/L account master data. 1. Define field status variant. Copy the variant 0001 to ABCD. Next, changes can be done in ABCD. 2. 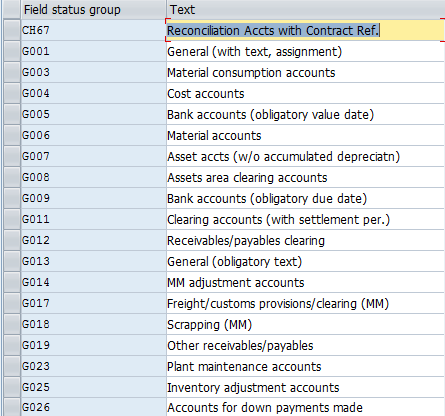 Field status group copied in the field status variant ABCD. Fiscal year divided into posting periods and special posting periods of a fiscal year. Each posting period is an accounting period/month. In the fiscal year variant, there are 12 periods and 4 special periods to be maintain. No postings are possible without assignment of a fiscal year variant to a company code. A fiscal year can be year dependent or year independent. Year independent means the same as calendar year. Year dependent means the accounting year is not same as a calendar year. For example, India accounting year starts from April and ends in March.